It seems like hardly a month goes by without at least a pair (or even a handful) of new cases from Lian Li. This month the Taiwanese case maker introduces the $199 PC-A75X and the $219 PC-A76X, two new all-black full-tower aluminium cases that support Micro-ATX, ATX, EATX and HPTX motherboards. Both cases are pretty much identical, the only difference is that PC-A75X has a standard, removable front panel, while the PC-A76X has a sleek, lockable front bezel door. Both models have two 5.25" drive bays, a whopping twelve 3.5" HDD bays (three can be converted to 2.5"), 11 expansion slots, room for VGA cards of up to 360mm, PSU lengths of up to 360mm and CPU coolers as high as 170mm. The top front I/O panel offers two USB 2.0 ports, two USB 2.0 ports and HD audio ports. Cooling is provided by three 140mm front fans and one 120mm rear fan. Most components can be installed tool-free and the interior of the case has the usual cut-outs for cable management and easy CPU cooler swapping. 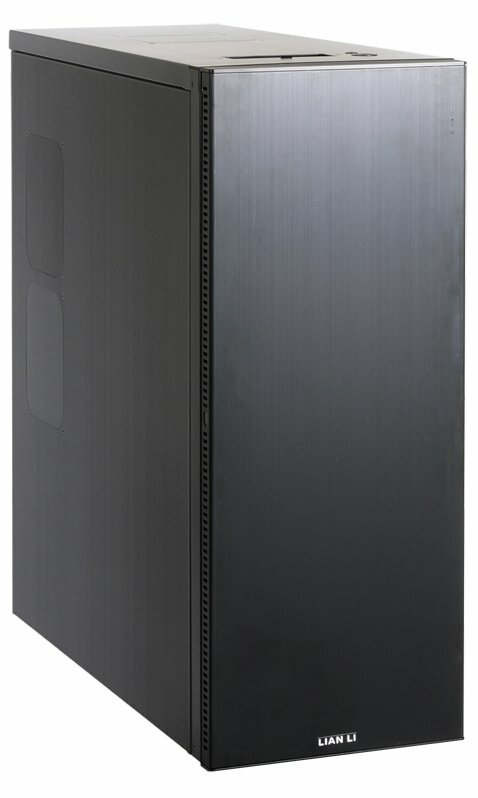 Lian-Li Industrial Co. Ltd, today announces two new brushed aluminum full tower chassis – PC-A75X & PC-A76X. These two new HPTX supporting chassis while having the same internal design offer two different aesthetic styles to fit your personal preference. Whether you prefer a front panel with visible ventilation or a more monolithic design, these two new 585mm (23”) tall and 220mm (8.6”) wide chassis will fit your style while holding the hardware you desire. 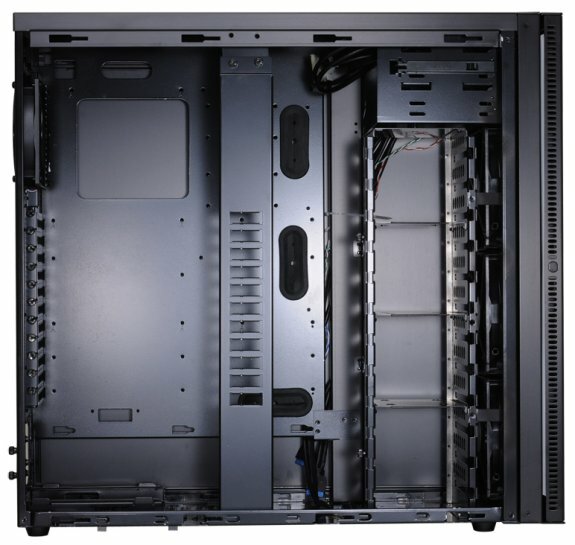 The PC-A75X's vented front panel allows cool air to be easily pulled into the chassis, and the two 5.25” bays are easily accessible from the front. The front panel of the PC-A75X is also tool-lessly removable. For those who prefer a more monolithic design, the PC-A76X has a lockable solid aluminum front bezel door covering the fans and 5.25” bays. Vents on the side of the door and bottom of the chassis ensure that cool air is pulled into the case, while still keeping its elegant design. The hardware capabilities of the PC-A75X and PC-A76X are identical and staggering. Both of these HPTX supporting cases can hold up to twelve 3.5” HDDs and up to three 2.5” SSDs using the 3.5” bays. The drives are easily installed thanks to included anti-vibration mounts and a tool-less sliding lock to fix the hard drives into position. Three 140mm fans blow cool air directly across the hard drive bay, and a 120mm fan at the rear of the chassis pulls the hot air out. The PC-A75X and PC-A76X both have the capabilities for two 120mm fans on the top and the side of the chassis for DIY builders looking for even more cooling options. Water cooling is also supported with two rubber grommets in the rear. These two new full tower Lian Li cases both have eleven expansion slots and can hold expansion cards up to 360mm (14.1”) in length. An arm helps to stabilize and secure longer, heavier expansion cards. CPU coolers up to 170mm high are supported, and the motherboard tray has a large CPU cutout so to support CPU cooler backplates. Additionally, several rubber grommets on the tray allow for simplified cable management. Power supplies up to 360mm (14.1”) in length can be placed in the bottom compartment. Ventilation slits underneath the PSU with a removable pull-out filter help increase the life and performance of the power supply. There are two USB 3.0, two USB 2.0 and HD audio ports on the I/O panel located on the top of the chassis so not to take away from the sleek styles. 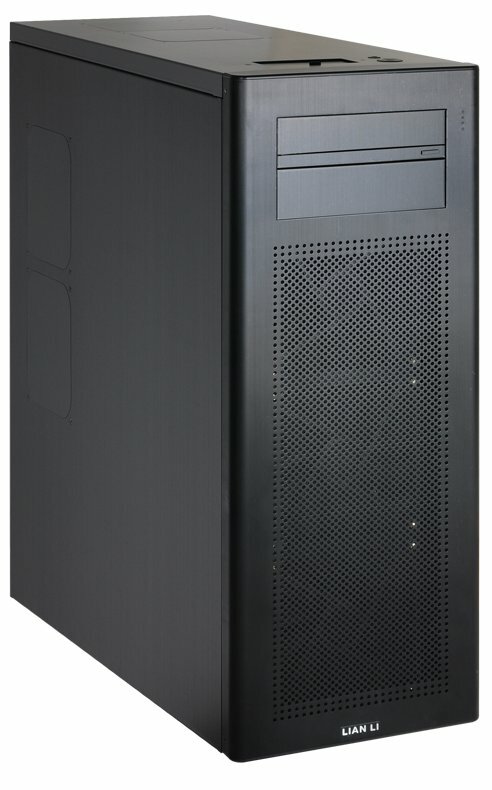 The PC-A75X and PC-A76X both come in black, inside and out, for the suggested retail price of US$199 and US$219, respectively (tax not included).